Fallback, a romance one-year starting Rhian Ramos, Zanjoe Marudo and Daniel Matsunaga directed by Jason Paul Laxamana under Star Cinema Productions and CineKoEntertainment. Released last November 15, 2017. A story of a girl named Michelle (Rhian Ramos)has fear of getting hurt in terms of love. So while she's with her present boyfriend, Chris (Daniel Matsunaga), feeling that he will break her up soon. She was convinced by her aunt to have a back up plan or fallback just in case they will break up. Then, coincidentally she come across with her ex- boyfriend (Zanjoe Marudo). A chance was given to them to rekindle their past love. Can Michelle prove that her fallback will succeed? 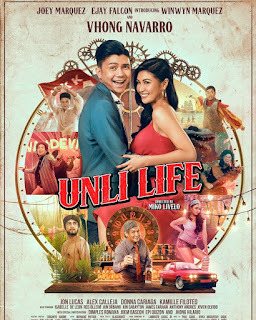 This film portrays another romantic-comedy with a unique plot and a lot of 'hugot line's.